☛Protect your power bank and other electronics. Bring our foreproof file folder, although we hope you will never use its fire protection function, but having this bag is an option you won't regret. DOUBLE LAYERS PROTECTION:Our newly designed power bank bag uses different materials than other bag.Double Layered design, high quality Black Non-itchy Liquid Silicone Coated Fireproof Fiberglass, this bag is FIRE and WATER RESISTANT.And it comes with a fireproof zipper.Fireproof bag can fully protect your power bank and other electronics. SIZE: 7.87" x 4.3" x 0.78" ,Weight:75g/2.65ounce,Equipped with Accessories Pocket and Fireproof zipper convenience for easy in Opening and Closing. WIDE RANGE OF APPLICATIONS: Fireproof zipper added security and safe transport. Provide double protection for your power bank when travelling or at home, you can be 100% confident that you are using power bank in a safe environment. Original Intention:Accidents happen when we least expect, and there's nothing more devastating than a fire that takes away valuable orone-of-a-kind paperwork, personal information, pictures or achievements. That's why we developed the fireproof power bank bag- Protect your power bank and personal safety,that won't let you down when emergency strikes. 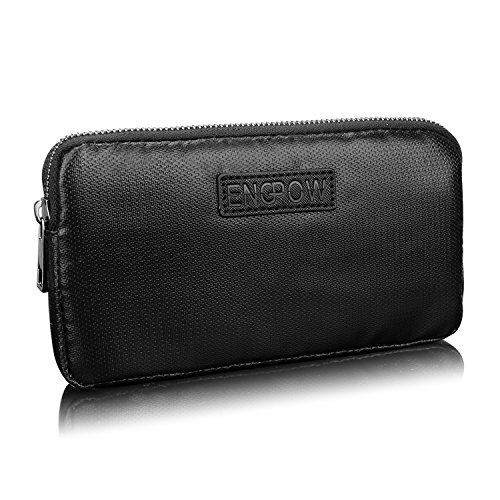 ❤Warranty:2 year Warranty: ENGPOW provide friendly after-sale service and no risk refund for our customers. If you have any issue,please contact us and we will try out best to solve your issue!